A barbell with a twist. 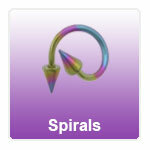 These twister or spiral belly rings are another alternative piece of jewellery for your belly piericng. Made from either 316L steel or Titanium (6AL-4V) they are available with a range of differing balls, cones jewels and spikes.